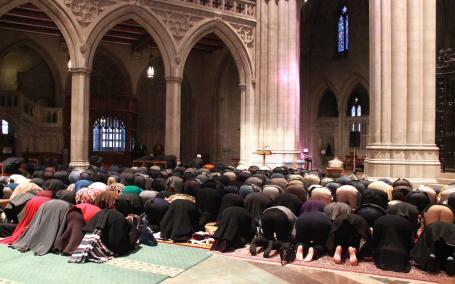 November 2014, the National Cathedral hosted Muslims for a time of prayer. There it was, a cross reminding us of the manner of death our Savior experienced at the front of the cathedral, but that cross wasn’t on the minds of Muslim men and women who prayed there that day. View a slideshow of the event via this link: SLIDESHOW. Muslims, in separate groups of men and women, took off their shoes, spread their prayer rugs facing east toward Mecca, turning their backs on the crucifix in front of the chapel, knelt and prayed. That event should solidify once and for all this simple truth: Muslims and Christians do not worship the same deity. The event is being co-sponsored by the cathedral, Rasool and several Muslim spiritual and advocacy groups: ADAMS — whose full name is the All Dulles Area Muslim Society — the Council on American Islamic Relations, the Islamic Society of North America, Muslim Public Affairs Council and Masjid Muhammad mosque in Northwest Washington. I think it helpful to explain what a Muslim country thinks of CAIR, the Council on American Islamic Relations. The United Arab Emirates names CAIR a terrorist organization. The Council on American-Islamic Relations (CAIR) was one of 82 groups around the world designated terrorist organizations by the United Arab Emirates, placing it in the company of Al Qaeda, Islamic State and others. While CAIR has previously been linked to Hamas, it has held hundreds of meetings with White House officials on a wide range of community issues and has sought to present itself as a mainstream Muslim organization. CAIR is, in fact, among the more than 300 unindicted co-conspirators of the Holy Land Foundation named by the government in the Holy Land Foundation prosecution. The trial has already produced evidentiary bombshells detonating along a path leading to CAIR. It has introduced evidence placing CAIR executive director Nihad Awad at the 1993 Philadelphia meeting of the Muslim Brotherhood’s Palestine Committee. FBI agent Lara Burns has testified that CAIR was listed as a member of the Palestine Committee. Hamas is an enemy of Israel. Hamas has pledged to wipe Israel off the face of the earth. Now, I agree it’s unfair to label all Muslims as enemies of Jews and Christians. To be sure, it’s a minority of 80% that give all the rest a bad reputation. It was my privilege to meet and talk with the young woman banker who uncovered unlawful cash transfers by the Muslim domestic terrorist organization the Holy Land Foundation. Over my lifetime, I have met, known and worked with some wonderful Muslim engineers and business owners who ardently love America and would never wish to harm our country. Islam defies definition because it has no center. Christianity centers on the life and words of Jesus Christ, as recorded in the Bible. Despite denominational differences, we all relate to one another by our abiding faith in the immutable Word of God. Islam is very different. No, Muhammad is not the center of Islam. If you wish to name a center of Islam, look to Satan. Social norms and geography yield Muslim beliefs and practices that vary greatly, much more so than Catholic-Protestant differences. ISIS is rapidly overwhelming so-called ‘moderate’ Muslims in the Middle East with a brand of Islam that knows no boundaries of decency. ISIS is barbaric even beyond previous brands of Islam. At first, al Qaeda disavowed ISIS, but now aligns with the Islamic State. Bottom line: Muslim ‘true believers’ take seriously all the murderous, hateful threats against Jews and Christians, we who are known as “People of the Book”. Call Islam what you will. I call it the oldest religion on earth: Satanism. Now the good news. Muslims in large numbers daily submit to the Lord Jesus Christ, principally due to supernatural visitations in dreams and visions, just as it happened to the Apostle Paul as he travelled the Damascu road on his way to slaughter and imprison Jews who became Christians. As a plan of action, I suggest these steps. Learn about Muslim Background Believers (MBB) and how it was they came to faith in Jesus. Various organizations hold training seminars for this purpose. Above all, don’t be deceived. Jesus is the way, the truth and the life. He is the Light of the World. Be bold in your faith. And, remember to pray daily for the Peace of Jerusalem and salvation of all Israeli citizens and residents.